Sage acts as a direct processor so they can offer merchant account management as well as credit card processing. This provides a benefit to merchants in the case of a chargeback or account hold by having only one point of contact to resolve the issue. Based out of Reston, Virginia, Sage Payment Solutions provides various merchant services for companies of all sizes. The Sage Group (founded in 1993) was purchased by GTCR in 2017 and has since become an independent organization. Sage offers a vast amount of business management tools ranging from accounting to human resources. Specifically, you can use Sage Payment Solutions as your sole credit card payment processor with or without enrollment in their many other available cloud-based software tools. Sage Payment Solution MERCHANT ACCOUNT: By using Sage Payment Solution as your direct processor, you can clearly know where to turn when you have problems with payment processing by having only one point of contact if you also use Sage as your merchant account. Sage Payment Solution PAYMENT GATEWAY: Sage Payment Solutions provides their own proprietary gateway for eCommerce merchants. This software is compatible with many different online shopping carts, including WooCommerce and Shopify. For pricing, you must contact a sales rep.
Sage Payment Solution COUNTERTOP TERMINALS: You can obtain EMV-compliant terminals via Sage Payment Solutions. Sage Payment Solutions’ countertop terminals (not all) also offer Apple Pay and Android Pay. It is possible to either buy or lease your terminal. Sage Payment Solution VIRTUAL TERMINAL: Enter transactions manually or with a USB card reader and use your computer as your terminal. Sage Payment Solution MOBILE PAYMENT: To compete with Square, Sage Payment Solutions developed their own app for Android as well as iOS. A month-to-month merchant account is needed to use this service. But you’ll receive a card reader that plugs into your mobile device for accepting credit card payments. Sage Payment Solution eCHECK (ACH) PAYMENT PROCESSING: Sage Payment Solutions can provide you with an imager to connect to your terminal that allows you to scan paper checks. You can also access Sage Virtual Check to accept ACH payments for eCommerve websites. Sage has plenty of resources for getting started. Attend “Sage University to learn how to effectively use their software. Access 24/7 customer support with articles, product resources, software downloads and updates, as well as Sage City (chat and forum support). You can even reach sage using their twitter handle @SageSupport or call them directly on their customer support line. How Much Will You Be Paying For Sage Services? Sage rarely discloses pricing on their website. 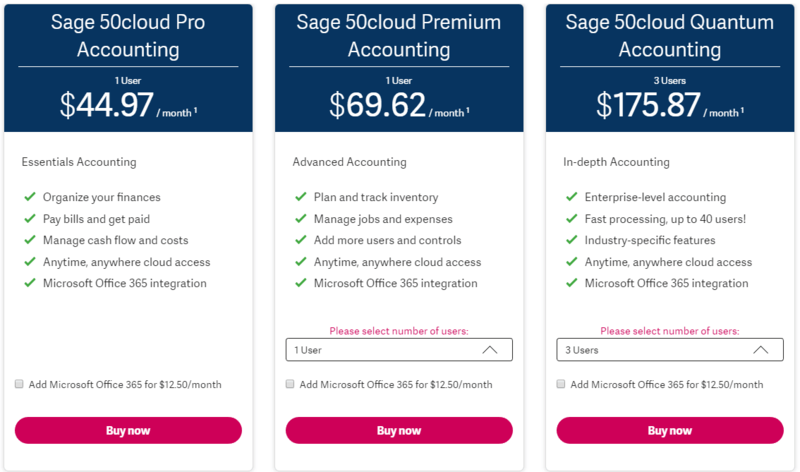 Besides their most basic packages like Accounting Start and Sage 50cloud, many of their business management solutions are customizable and will vary depending on the tools you opt for when signing up. When it comes to credit card processing, they cannot quote customers a flat rate on their website because this is a percentage that is continuously in flux. You can contact a sale representative to find out the rates they offer and then negotiate their fees for credit card processing before signing a contract. If you are currently working with Sage or considering signing up with Sage, speak with merchant account experts at Verisave. We have worked with Sage Payment Solutions on behalf of our clients throughout many industries and can help you to navigate the negotiation process to acquire the lowest rates using their most efficient tools, pricing plans, processing rates, and more. To get the most out of Sage Payment Solution services, Verisave can compare your initial quote or current plan from Sage against our benchmark data. This proprietary data is comprised of over 500 companies’ credit card processing data. You have a more clear understanding of the plan and pricing offered to you by Sage and whether or not you can expect better pricing or better service options from another company. If you sign up for a full-service merchant account from Sage Payment Solutions, you will have a non-negotiable 3 year contract for those services. There is also a clause in the contract to automatically renew services every 2 years after that. Sage’s contract length tends to cause the most concern in negative reviews. There are many companies out there that have similar contract lengths. But you can still find other reputable companies with shorter contracts. Sage does offer month-to-month contracts for a Sage Mobile Payment account. Should you be under contract with Sage and wish for an early termination, it is relatively expensive. It requires at least 30-days notice of termination and an early termination fee. For each month remaining on your contract, you will pay a set fee for early termination. For small businesses using Sage, an early termination fee could quickly become more costly than it is worth. If you are considering terminating your contract with Sage and still have a considerable amount of time left on your contract, it might be wise to ride out the length of your contract. Just be sure to take the necessary steps to avoid automatic renewal. Of course, this will all depend on the services you’re using and the potential savings for early termination and changing your merchant services provider. Researching Sage Services – Simply learning about Sage Payment Solutions tools and services from their website is difficult. Much of their information is very vague and solely written from a marketing perspective. To really understand their services and the features offered by their cloud-based tools, it is better to speak with an in-house sales representative. Avoid speaking with partner ISOs who also sell Sage services. Speaking with in-house sales reps will likely result in more transparent information. Contacting Customer Support – Troubleshooting is done easiest by using Sage’s online knowledgebase. Going hear first to find solutions to common problems can save you a lot of time. But in case you are in need of more help, they also have 24/7 telephone and email support. Sage Payment Solutions is a relatively new company, having just recently split from The Sage Group in 2017. As such, they are not yet accredited with the Better Business Bureau. They also have limited online reviews. We believe it is always important to remember that most reviews come from unhappy customers. As we consider what each reviewer is saying, we look for common trends in the review to find what is the majority consensus. Our team of auditors have worked with a number of clients using Sage Payment Solutions and their credit card payment processing services. We have become very familiar with the services they offer, their standard contractual agreements, fees, and payment structures for credit card processing. We have found that a majority of the complaints filed against Sage Payment Solutions are due to a lack of transparency or miscommunication. Using a merchant account auditing firm like Verisave can give you a leg up on Sage with valuable backend knowledge of their sales practices and average rates other customers have achieved. We suggest you first speak with a sales rep at Sage Payment Solutions to see what rates they offer you for their credit card payment processing services. Before committing to their contract, speak with Verisave to see what more we can do to help you achieve the lowest rates and pricing possible for credit card processing, contract length and renewal, and more with Sage Payment Solutions. If Sage Payment Solutions is not the best fit for your business, we can point you in a better direction. 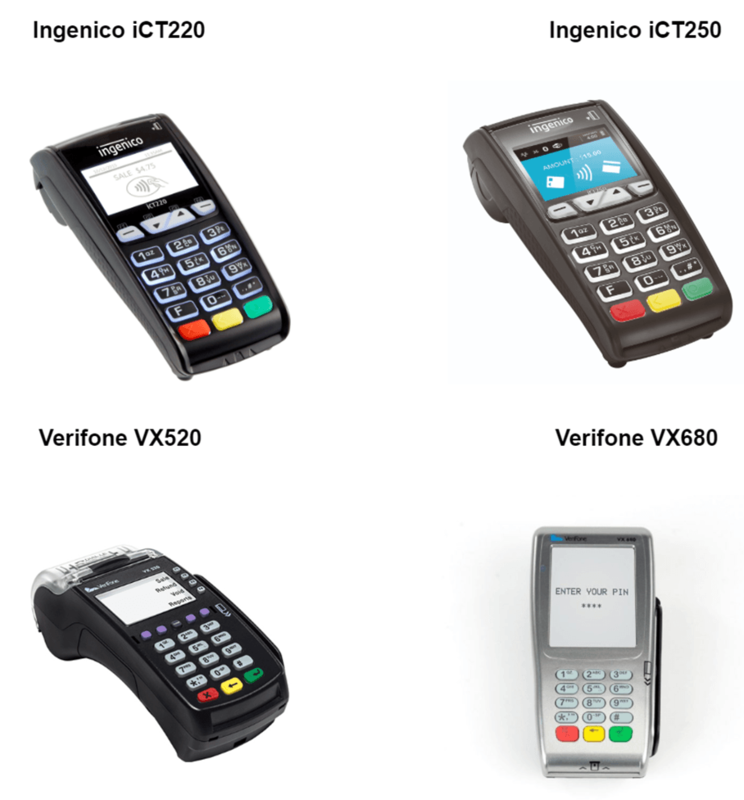 Verisave has worked with over 500 companies to reduce their merchant services fees and credit card processing rates. Our extensive knowledge gained by working with processing and merchant services companies like Sage (and many more) is the advantage your business needs to maximize their bottom line. Sage, like many similar companies in this industry, offers their own version of a customizable business/enterprise management solution. This is cloud-based software that provides many services for business owners. Their tools are to simplify processes dealing with accounting and other financial services, HR, payroll, communication, credit card processing, and other banking procedures. ACCOUNT START – This package is very basic. If your business is small and you are uncomfortable coming up with your own recording system for finances, you can record them in Sage’s Account Start pre-made templates. 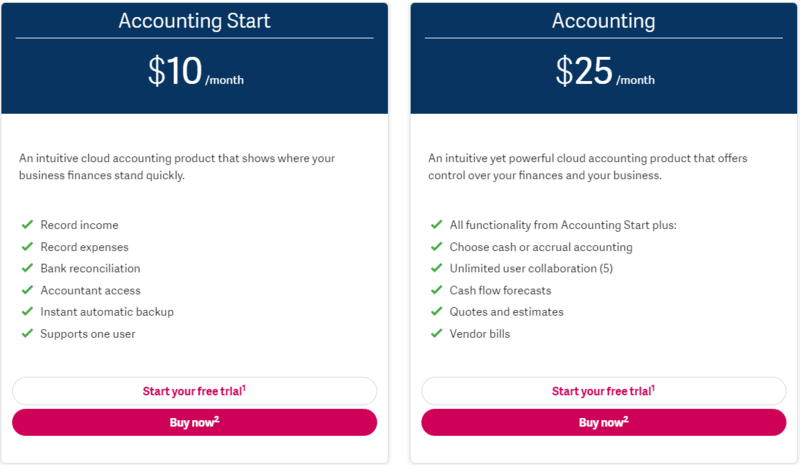 ACCOUNTING – This package is a small step up from “Account Start”. Small business owners may find it helpful to store financial data in this cloud-based software because it compiles data and creates basic accounting reports. SAGE BUSINESS CLOUD FINANCIALS – For more extensive accounting and business finance tools, Sage offers larger, customizable packages that vary based on your individual needs. These systems offer enhanced accounting tools, analytics and reporting, subscription billing and invoicing; they also offer multi-location, multi-currency, multi-company and multi-language capabilities. All software and business management tools can be tracked in real time and viewed on mobile devices. SAGE INTACCT – Prices for this business financials management service vary based on company needs. These digital accounting software products provide 24/7 operations, upgrades, and enhancements, as well as US-based customer support. Sage Intacct offers flexibility for growing companies. If you sign up with these services and find the need for more modules in the future, they can be added to your software. TEAM MANAGEMENT – These HR and management tools are recommended for midsized companies (200-5000 employees). Tools are available for attracting the right employees, managing teams, and retaining staff members. These cloud-based HR tools are available from desktop and mobile devices. PAYROLL TOOLS – 24/7 access to payroll tools. You can customize the payroll process by selecting which aspects you would like to remain hands-on and which issues you would like Sage tools to manage for you. Sage has tools to pay and file your taxes. Employees can have access to online payroll info. PAYMENTS & BANKING TOOLS – Receive all forms of payment with Sage Processing Solutions. 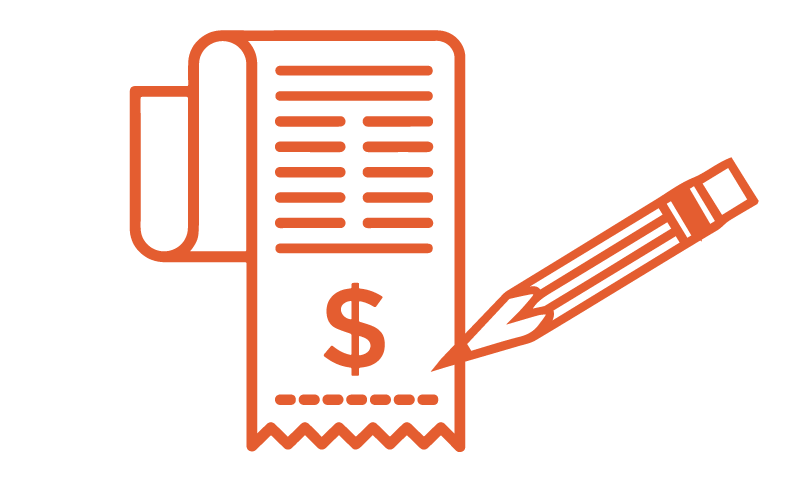 They offer tools for invoicing/e-invoicing and subscription billing. Sage can also provide POS systems for debit/credit payments and chip cards. eCommerce tools are available as well as the ability to accept payments from digital wallets. 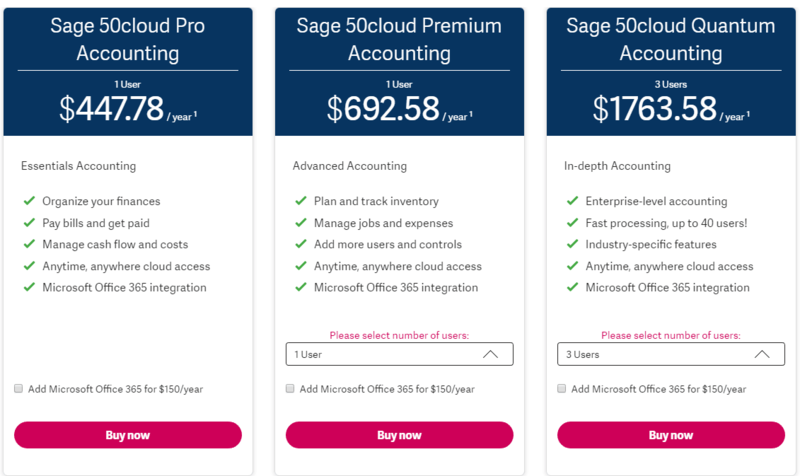 SAGE 50CLOUD – Built-in accounting with inventory, tax, and invoicing tools. Software security to protect your private information and client information. All of the tools are mobile friendly. Customize your package based on business needs and the number of employees needing access. SAGE 100CLOUD – This package includes tools for accounting, manufacturing, distribution, inventory management and more. It is a customizable business management solution for growing manufacturers, distributors, and retailers. Know your exact cash position at any time with real-time reporting. 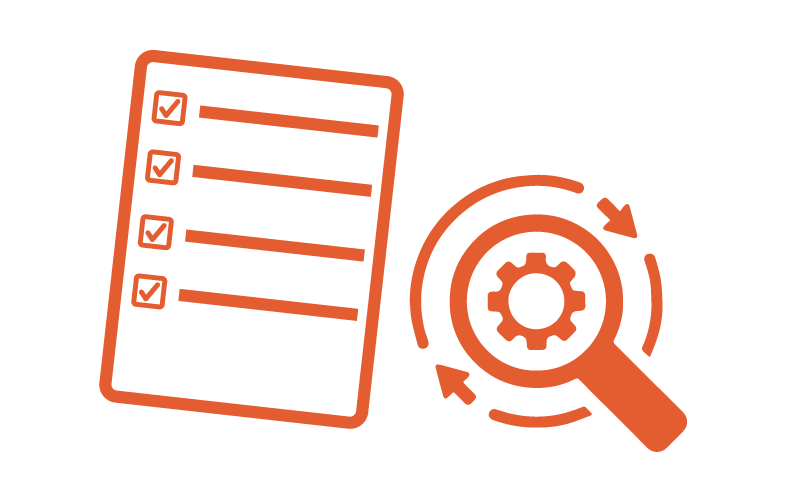 Create supply chain reports with data collected from across your business. SAGE 300CLOUD – Offers more tools than Sage 100cloud but similar options exist such as accounting, inventory, operations, and distribution tools. Their software is capable of working with unlimited currencies, exchange rates, and locations; also, report results by company or consolidated company. Track multi-location inventory data. Accept credit, debit, checks, and mobile payments in your store, online, over the phone, or on your website with your customers. Another tool with Sage 300Cloud allows you to print checks. SAGE 300 CONSTRUCTION & REAL ESTATE – Similar to Sage 300Cloud, Sage has created an enterprise management solution specific to the needs of construction and real estate industries. Sage DacEasy – This is a simplified account solution tool. Currently, they are no longer updating this software and transitioning users to Sage 50. Sage Time and Attendance – This is employee attendance software, tracking employee time. 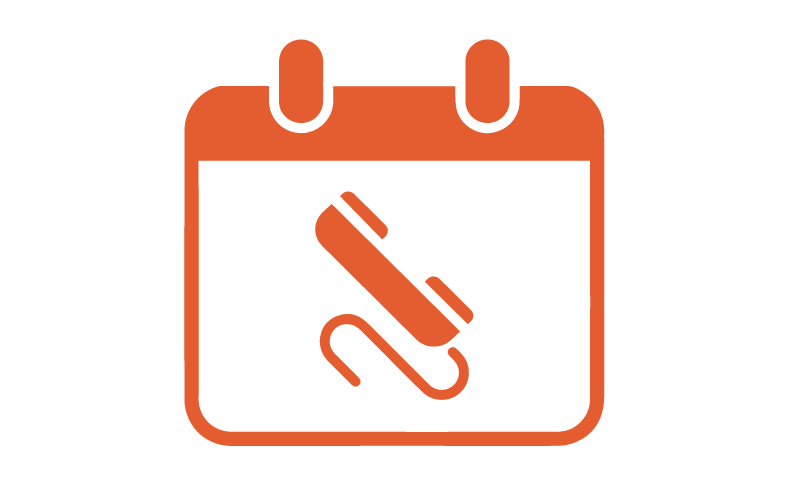 Used for time-off requests, accrual tracking, timesheets. Sage Service Bureau Solutions – Payroll software designed for growing (small) businesses. Sage Timeslips – Time tracking and billing software. Different that employee focused time tracking, this software tracks billable hours. Sage Payroll HCM – Sage’s HR software, for hiring and onboarding employees. Sage Payment Solutions – Business cloud accounting software for small/growing business. Sage Debit and Credit Card Processing – Accept and process credit/debit card transactions. Accept all major credit cards including Visa®, MasterCard®, American Express®, Discover®, Diners Club®, and JCB. Multiple POS systems available including mobile. Sage Electronic Check and ACH Processing – Accept ePayments and ACH check processing. Sage Mobile Payments – Specific mobile payment processing software from Sage. Sage Exchange – Payment management system to view all payment data and create reports. Sage International Payments – Make and receive secured payments from international customers and clients. Sage CRM – Customer relationship management software that automates basic sales tasks like quotes/orders, forecasting sale, and progressing leads. 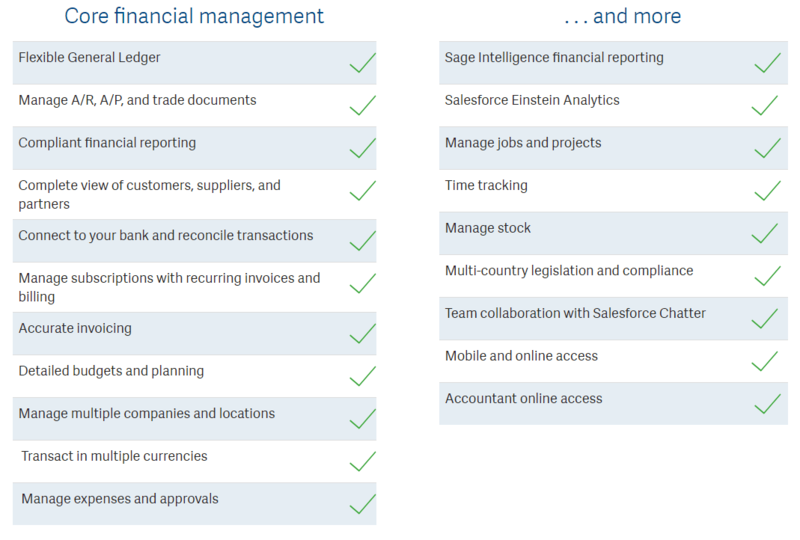 Sage Intelligence Reporting – Track and manage business data with customizable reporting. Sage Enterprise Intelligence – Enterprise management software for mid sized/larger companies. Sage Inventory Advisor – Cloud inventory software. Sage 500 – Enterprise management software. One of Sage’s large software packages available. Sage 300 Construction – Enterprise management software specifically created for construction and real estate industries. One of Sage’s large software packages available. Sage 100 Contractor – Business management software for small construction companies. Sage Paperless Construction – Web-based software made for construction companies to end the use of paper in the office. Sage Project Center – Centralized collaboration between many groups within the company for project completion. Sage Estimating – Cost estimation software for project proposals. Sage BusinessWorks – Simplified accounting tool with system management, a general ledger, and cash management. Sage Integration Cloud – Sage’s web-based software platform created to integrate all of their tools together. Sage Accountants Network – Access to many of Sage’s accounting tools, accounting help/experts, and continued education for accounting related to business owners. Sage Business Cloud Accounting – Software targeted toward actual accountants in the service of business owners; not targeted towards business owners manage their entire workforce. Sage Accountant Cloud – Sage’s primary accounting tool for business management.